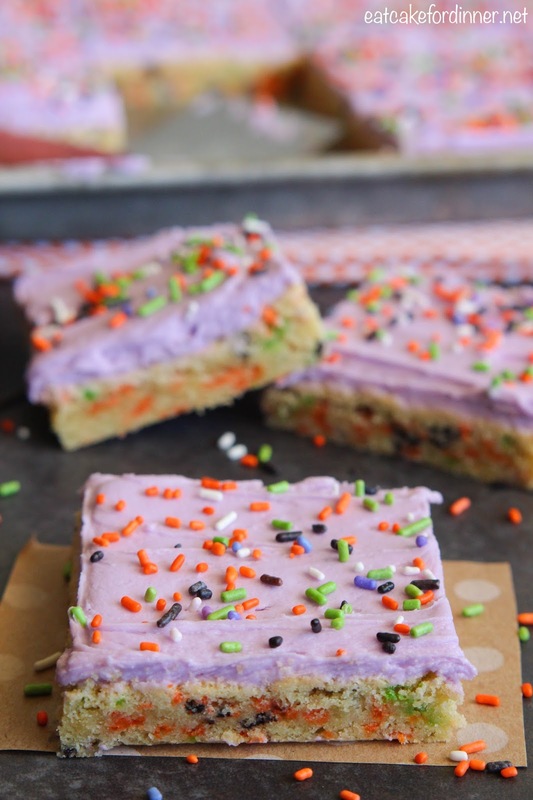 Sugar Cookie Bars are one of my favorites. They are so soft and chewy and they have a sweet buttery flavor. Plus, they are so easy to customize for different holidays. 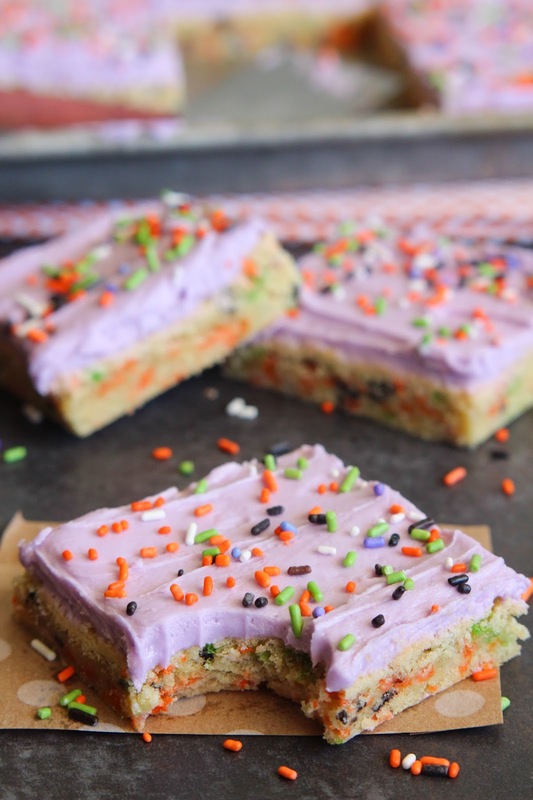 By adding Halloween colored sprinkles to the cookie dough, topping with colorful frosting and more sprinkles, it immediately transforms a plain bar cookie into something extra special. I seriously love these sugar cookie bars and could eat the entire pan by myself. They taste great on day one and soften up even more on day two. I wrote this recipe for a 9x13-inch pan, but it can easily be doubled and baked in a large cookie sheet if you are serving a crowd. purple or orange food coloring, opt. Preheat oven to 375 degrees. In a medium bowl, cream together butter and sugar. Mix in the vanilla. Add the eggs, one at at time, beating after each addition. Combine the flour, salt and baking soda and add to the creamed mixture. Last, stir in 1/4 cup of sprinkles. Press dough evenly into a greased 9x13-inch pan. It will be a little sticky. Bake in preheated oven for 14 minutes. Remove from oven and cool completely. For the Buttercream: Beat butter until creamy. Add a pinch of salt and vanilla and mix until combined. Add one cup of powdered sugar and mix until combined. Add remaining powdered sugar and beat until smooth and creamy, adding a little milk, as needed, to reach desired consistency. A little milk goes a long way, so don't add too much. If adding food coloring, add now and mix until combined. 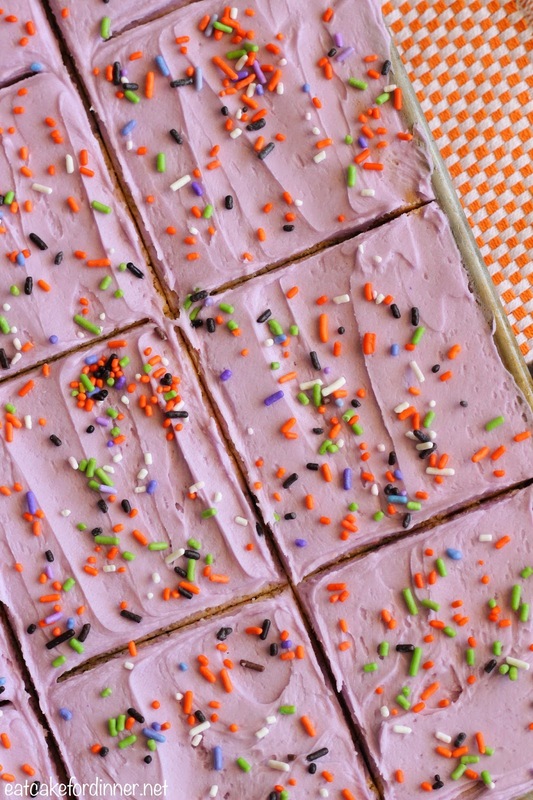 Spread over cooled sugar cookie bars and garnish with additional sprinkles. Cut into squares and serve.